It’s not clear what Mario Draghi meant when he said the European Central Bank would do whatever was needed to preserve the euro zone. The market thinks the ECB president was promising more purchases of Spanish and Italian bonds to drive down their oppressive yields. Investors may be right. But anyone expecting a game-changing crisis response could be in for disappointment. Draghi’s comments, made at a UK investment summit, are easy to overplay. The reality is that he didn’t specifically mention bond buying, and some form of ECB action was already looking likely given the worsening crisis in Spain and Italy. Moreover, bond buying isn’t Draghi’s only option: the ECB could lend to euro zone banks on longer terms, cut interest rates, buy other assets, or agree to finance the European Stability Mechanism if the bailout fund is given a banking licence. The idea of turning the ESM into a bank resurfaced this week after comments from Austrian central bank governor Ewald Nowotny. The ECB’s existing stance has been that such a move would breach the European treaty, making it an unlikely prospect in the short term. That said, more bond-buying is almost certainly on the cards. Draghi spelt out how bringing down sovereign yields could be considered within the ECB’s mandate if necessary to restore the transmission of monetary policy – a justification used for sovereign bond purchases in 2010 and 2011. In his view, the ECB should intervene when yields reflect factors that are not “inherent” to a particular country or its credit risk, say because markets are pricing in a euro breakup. The real question is what the size and scope of any bond-buying would be. To really end the crisis, markets would need to see unlimited purchases, or a commitment to fix yields at low levels. But the Bundesbank would certainly frown on that. The ECB would need to overcome markets’ concern that bonds held by the central bank rank senior to other creditors, as happened in the Greek restructuring. Otherwise, the more bonds the ECB buys, the more markets will worry about being subordinated to it. Moral hazard will also restrain Draghi. Bond purchases could ease pressure on governments to fix their economies; both Italy and Spain still need to pass tough reforms. So long as the onus is on euro zone members to behave, don’t expect fireworks from the ECB. 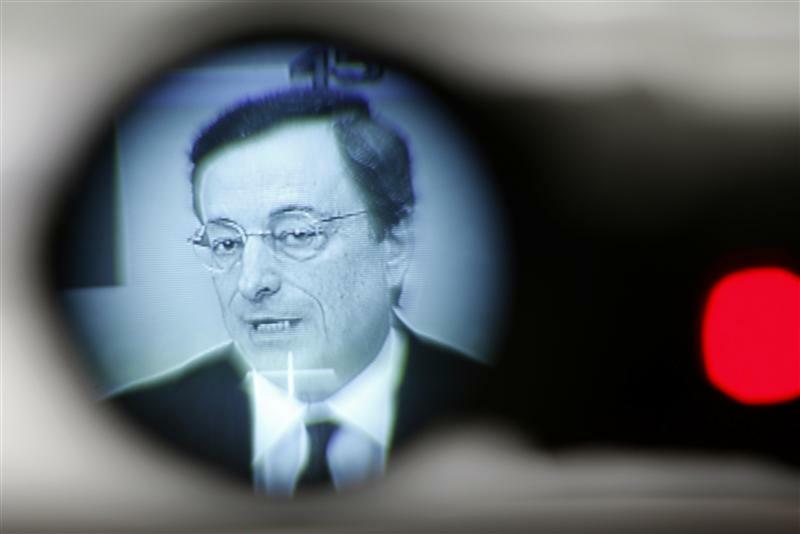 Mario Draghi, president of the European Central Bank, hinted that the bank could take action to tackle the crisis and bring down euro zone sovereign bond yields. Draghi also stressed that combatting sovereign yields falls within the ECB’s mandate to the extent that a country’s risk premia do not reflect its credit quality. Spanish 10-year bond yields fell below seven percent after Draghi’s comments from 7.583 percent. On July 27 they were yielding 6.95 percent.